Southeast of the city of Mons, near Spiennes, a signalman nonchalantly makes his way along a railway line, occasionally stopping to light the trackside lamps, echoing the same routine he has carried out a hundred times before, only today something is different. The quiet summer’s evening had become restless, and his thoughts, as he proceeds along the tracks, are periodically interrupted by the occasional chink of metal striking the rails. Unknown to the signalman, huddled together on the other side of the railway line behind an embankment, were men of the 2nd Battalion Grenadier Guards, watching in astonishment as the man continued his work, seemingly unconcerned by the peril unfolding around him. An officer calls out in French, warning the local that the Germans were advancing, to which the man is heard to mutter ‘ça m’est égal’ (I don’t care.) With bullets and shells whistling over their heads the Grenadiers remained concealed, waiting for orders to advance and engage the enemy – an order that would never materialise. Instead, the guardsmen were given the edict to retire and began a long, exhausting and generally demoralising retreat from Mons. It was 23 August 1914; the battalion had been in France for exactly ten days and would have to wait another 48 hours before they were given their first crack at ‘The Hun’. 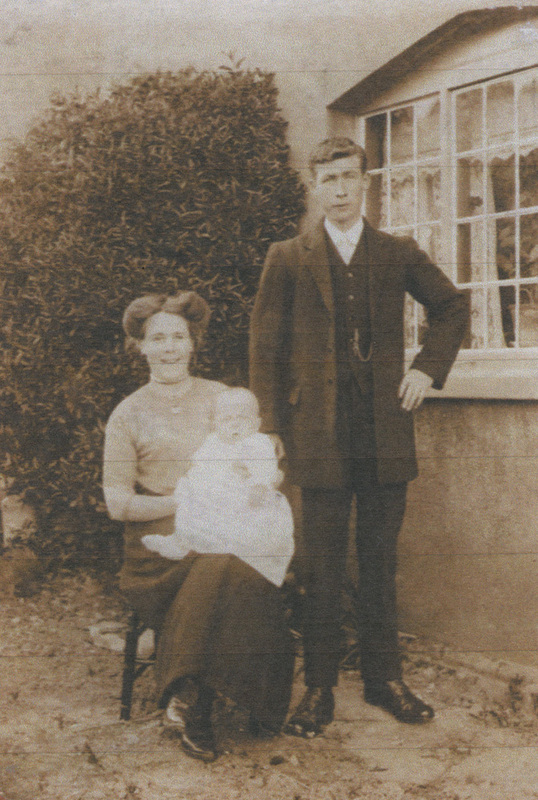 The Parris family had worked as agricultural labourers in Offham for over a hundred years. Leonard was born during February 1889 and the third of 12 children of James Parris, a local labourer, and his wife, Jane Standen. In 1891 the family lived at Hayes Cottage and had moved to Kettle Cottage (also in Offham) by the time of the 1901 census. Leonard and his siblings probably attended the village school and when old enough he joined his father working in the fields as a farm labourer. 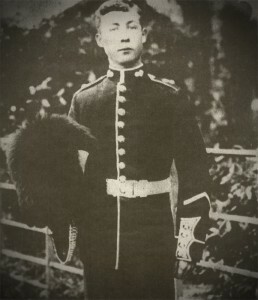 On 26 March 1907, at the age of 18, Leonard visited the recruiting office in Maidstone and signed up for 12 years with the colours (three years Army Service and nine in the Reserve.) Like his older brother James, who had enlisted the week before, Leonard joined the Grenadier Guards and was assigned to the 1st Battalion. At the time he gave his address as Godwell Cottages in Offham and was recorded in an army medical examination as being 5’ 7” in height, weighing 125 lbs with a fresh complexion, grey eyes and brown hair. In the box reserved for noting any distinctive marks, the examining officer duly noted that Leonard had a two-inch scar below his right knee joint. Leonard was passed fit for service and sent to join his unit at Wellington Barracks in London. During 1908 Leonard was based with the battalion at camp in Aldershot and eventually transferred into Section ‘B’ of the Army Reserve (meaning he could be called upon in the event of general mobilisation) on 26 March 1910. Around the same time, the Parris family moved to Platt and took up residence at 15 Whatcote Cottages. Leonard’s brother James had extended his period of Army Service, while Leonard had returned to farm labouring. Living with the family in this period was a 22-year-old general servant from East Peckham named Daisy Ellis. Leonard must have taken a shine to Daisy, and they were married in the Platt Parish Church by the Reverend Brand on 4 November 1911. Eight months later, on 13 July 1912, Daisy gave birth to a son named Alfred Leonard James, with a daughter, Daisy Emily Jane, born two years later on 26 June 1914. At the time of his daughter’s birth, the drums of war would have been beating loudly, and Leonard must have feared that time spent with his young family would soon be interrupted by escalating events on the continent. War with Germany was declared on 4 August, and Leonard was immediately mobilised for active service. Along with his older brother Frederick, who enlisted in 1908, he re-joined his unit in London, however, their brother James had been discharged from the Army during 1913 for robbery, and was serving 12 months hard labour in prison. 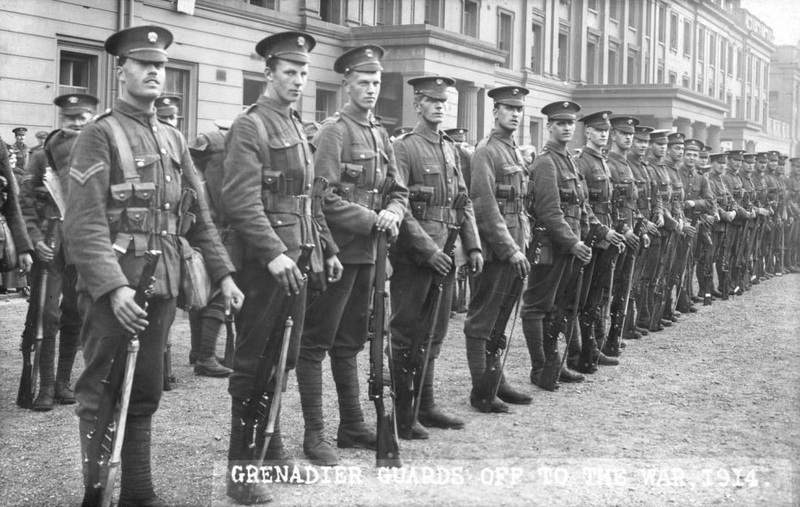 Leonard was assigned to the 2nd Grenadier Guards, while Frederick was posted to the 3rd Battalion, both of which were based at Wellington Barracks. Within a month their younger brother Ernest would also enlist and joined the same regiment, although, like Frederick, he wouldn’t see overseas service until 1915. You are ordered abroad as a soldier of the King to help our French comrades against the invasion of a common enemy. You have to perform a task which will need your courage, your energy, your patience. Remember that the conduct of the British Army depends on your individual conduct. It will be your duty, not only to set an example of discipline and perfect steadiness under fire, but also to maintain the most friendly relations with those whom you are helping in the struggle. The operations in which you are engaged will, for the most part, take place in a friendly country, and you can do your own country no better service than in showing yourself in France and Belgium in the true character of a British soldier. do anything likely to injure or destroy property, and always look upon looting as a disgraceful act. You are sure to meet with a welcome and to be trusted; your conduct must justify that welcome and that trust. Your duty cannot be done unless your health is sound. So keep constantly on your guard against any excesses. In this new experience you may find temptations in wine and women. You must entirely resist both temptations, and while treating women with perfect courtesy you should avoid any intimacy. You are leaving home to fight for the safety and honour of my empire. Belgium, whose Country we are pledged to defend, has been attacked and France is about to be invaded by the same powerful foe. I have implicit confidence in you, my soldiers. Duty is your watchword, and I know your duty will be nobly done. I shall follow your every movement with deepest interest and mark with eager satisfaction your daily progress, indeed your welfare will never be absent from my thoughts. I pray God to bless you and guard you and bring you back victorious. That evening Leonard entrained for the front, which at that stage was near the Belgian city of Mons, and reached the outskirts on the 23rd where the battalion bivouacked in a field waiting for further orders. In the distance, he would have heard the battle raging, and with nervous excitement coursing through his body, probably suspected that he was about to plunge headlong into the fray. About 6:00 pm the battalion moved off and passed through Harveng before proceeding in artillery formation towards a hill near Spiennes, where they encountered the laissez-faire railwayman. Unknown to Leonard, at the time his unit began to retire, two German Corps (which consisted of many thousands of men) were bearing down on their position. 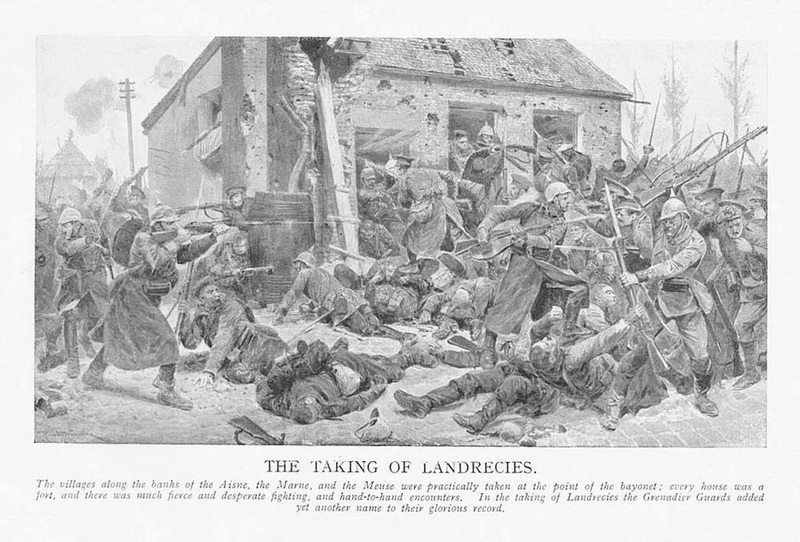 The Grenadiers eventually engaged the enemy for the first time at the small town of Landrecies during the evening of the 25th. ‘Shadowy forms’ were spotted moving about in the darkness, with a voice, realising they had been spotted, calling out “Don’t shoot, we are French.” This trick was new to the men, and having hesitated, the Guardsmen quickly found themselves being rushed by German infantry. The 4th Guards Brigade in Landrecies was heavily attacked by troops of the Ninth German Army Corps, who were coming through the forest on the north of the town. This brigade fought most gallantly and caused the enemy to suffer tremendous loss in issuing from the forest into the narrow streets of the town. This loss has been estimated from reliable sources at from 700 to 1000. At daybreak on the following morning, the battalion was ordered to retire and marched south with the brigade towards the village of Etreux. Exhausted, Leonard and his comrades trudged on, falling asleep every time they stopped for a brief rest – even if only for a few minutes. Upon arrival, and in a moment of light relief, the men had their first sight of a German plane, and all shot at it as it flew away like a ‘wounded bird’ (it eventually came down and was captured by another division) however within a few hours, the retreat resumed, with malcontents in the battalion muttering that they were heading in the ‘wrong direction’. By 31 August the Grenadiers reached the town of Soucy and temporarily dug in on the high ground before withdrawing to take up a position in the Retz Forest, where they were to cover the retreat of the rest of 2nd Division through Villers Cottérêts. Leonard’s unit was based along the main road running east and west through Rond de la Reine, and it was assumed that the advancing Germans would not attempt to attack through such a dense environment. They were wrong, and the battalion found themselves suddenly engaging the Germans at close quarters with bayonets. Substantial casualties were sustained on both sides; however, Leonard survived and was among the Grenadiers who withdrew to Boursonne, where they took up another rear-guard position to cover the retirement of the 6th Brigade, who had also encountered the Germans in woodland. It was a sadly tattered, unshaven, footsore body of men that marched at 3 o’clock next morning through La Celle and Malmaison Farm to Fontenay, where they went into billets. No Londoner seeing them would have guessed that these were the same smart Grenadiers whom he had often admired on the King’s Guard. But if their looks were gone, their spirit was indomitable as ever. After a most trying series of operations, mostly in retirement, which have been rendered necessary by the general strategic plan of the Allied Armies, the British Forces stand to-day formed in line with their French comrades, ready to attack the enemy. Foiled in their attempt to invest Paris, the Germans have been driven to move in an easterly and southeasterly direction, with the apparent intention of falling in strength on Fifth French Army. In this operation they are exposing their right flank and their line of communication to an attack by the Sixth French Army and the British Forces. I call upon the British Army in France to show now to the enemy its power and to push on vigorously to the attack beside the Sixth French Army. I am sure I shall not call on them in vain, but that on the contrary by another manifestation of the magnificent spirit which they have shown in the past fortnight they will fall on the enemy’s flank with all their strength, and in unison with their Allies drive them back. The operation began in the early hours of 6 September, bringing the BEF up to a line parallel with, and a few miles southwest of the Grand Morin-Aubetin Rivers. Leonard was in action again two days later when his unit attacked along the Marne at a battle that would eventually force the enemy back, and halt their advance on Paris. In the assault, the 4th Guards Brigade, supported by three brigades of the Royal Field Artillery (which included a heavy battery), mounted an attack on several bridges along the Petit Morin River in the area of La Trétoire. Confronted with both infantry and machine-gun fire, the ensuing battle was ferocious and at times confusing, however, the brigade fought valiantly and was able to forge a river crossing which allowed the cavalry to advance and force the Germans to fall back. With a retreat in full-effect, Leonard’s battalion was tasked with pursuing the enemy and engaged them again along the main road from Montmirail to La Ferté sous Jouarre near Orly. After their defeat at The Battle of the Marne, the German armies undertook a tactical withdrawal towards the River Aisne. The Allied pursuit had been slow due to fatigue, stretched supply lines and having had to tackle numerous enemy rear-guard actions which consequently allowed the Germans time to dig in on the high ground north of the river and command a superior defensive position with full field of fire covering all the river crossings. This meant that in addition to crossing the river, the BEF would then have to attack uphill. The first British troops navigated the Aisne during the night of 12 September with Leonard’s unit crossing under cover of darkness the next day. On this occasion, they were unable to gain a foothold and had to withdraw until the following morning, when they were able to make a more successful attempt via a pontoon bridge that the Royal Engineers had constructed during the night. Moving forward with the Connaught Rangers, the Grenadiers soon came under attack from German infantry at a large farm called La Cour de Soupir. Reinforced by the Coldstream and Irish Guards, the guardsmen fought courageously against overwhelming enemy numbers. Hampered by successive German counter-attacks across the fields, and through dense woodland, British casualties rapidly mounted as they made repeated attempts to advance. Many of the battalion officers were wounded or killed, which added to the overall confusion and they were dealt a further blow two days later when a German artillery shell hit a group of Grenadiers situated on the edge of a quarry pit. About half the company (59 men), were killed outright, with further casualties sustained in the quarry below. After this disaster, just before dawn the following day, the battalion was relieved and went into billets at Soupir; however, the respite was temporary, and they were almost immediately called back to the line and began work digging and deepening the trenches. Throughout the next few days, Leonard’s unit was under constant heavy shellfire (it was calculated that on average, 50 shells a minute were falling on what was left of the battalion) and they valiantly repelled numerous enemy attacks that occurred both day and night. Sleep was non-existent due to the German practice of sending out specially selected snipers after dark to keep the whole line from getting any rest. The battalion was finally withdrawn from the sector at 4:00 am on the 21st and relieved by the Irish Guards. From there Leonard marched to Chavonne where his unit took over the trenches held by the 1st Cavalry Brigade. This section of the line was deemed considerably quieter, and the Grenadiers spent the next three weeks holding the same position. What we know as trench warfare had now begun, and months of comparative inaction were to follow. The Grenadiers eventually left the Aisne on 12 October and entrained at Fismes two days later. Between 35 and 40 men were tightly packed into each covered truck, leaving hardly any room to sit down, and over the next 24 hours, the train rumbled across northern France, passing through Paris, Beauvais, Amiens, Etaples and Calais before coming to a halt at Hazebrouck at 7:00 am on the 15th. Sir John French now calculated that the Germans might now attempt a wide turning movement on his left flank, and consequently, he sent the Corps north towards Ypres. The 2nd Grenadiers were among those ordered into Belgium, where they took up an entrenched position north of Ypres at St. Jean, before moving to Hanebeek Brook, which was about two miles west of Zonnebeke. Five days later the battalion moved forward to Polygon Wood and took part in an attack on the Reutel Spur, after which they withdrew to the line and held their position against several counter-attacks. During the next few weeks, the battalion was under almost continuous duress from shellfire, with the battalion War Diary recording casualties virtually every day up until mid-November. On one occasion an entire company was almost entirely wiped out by enemy artillery fire, and it seems likely that Leonard became a victim of such action during this period. Severely wounded, Leonard was evacuated to Wimereux Hospital near Boulogne where he died from his injuries on 11 November. He was buried in the town’s communal cemetery and posthumously awarded the 1914 Star, British War and Victory Medals.